Today we bring a list of latest jQuery plugins released in June 2014. These plugins are fresh, interesting, simple and lightweight. You may find them useful for your next project!!! jQuery Eraser is a jQuery plugin that makes an image erasable (with mouse or touch movements) This plugin replaces the targeted image by an interactive canvas that can be erased using touch or mouse inputs. jQuery fontIconPicker is a small (3.22KB gzipped) jQuery plugin which allows you to include an elegant icon picker with categories, search and pagination inside your administration forms. The list of icons can be loaded manually using a SELECT field, an Array or Object of icons or directly from a Fontello config.json or IcoMoon selection.json file. A jQuery plugin for adding simple scrolling effects to web pages. jReject is a simple, light-weight library designed to display a popup based on a the browser, specific browser version, specific platforms, or rendering engine. Provides full customization of the popup. Uses a small CSS file, and can easily be used on page load or during a specific page event. Also provides a flexible way to beautifully and cleanly display custom browser alternatives in the popup. Amaran JS is a jQuery plugin to create beautiful and stylish notifications with animations. jNottery is a jQuery plugin that lets you add notes and markers to webpages. All the data is encoded as a part of an URL which makes it easy to share or save. CoverVid is a jQuery plugin to make your HTML5 video behave like a background cover image. It's so easy to use. 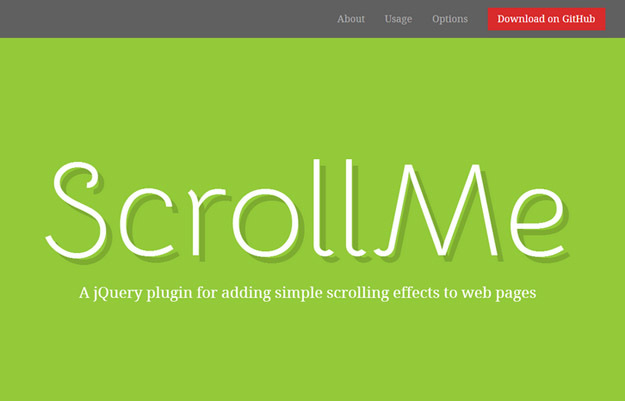 Scrollify is a jQuery plugin that assists scrolling and smoothly snaps to sections. Fully configurable and optimised for touch. Shuffle Images let you display and shuffle multiple images by moving cursor around or several other ways to trigger.This plugin is perfect for when you want to save space while allowing users to take a peak at what other images are related to the one displayed. It can also be used to create an interactive animation on multiple static images at once. Crossfade.js is a tiny (~3kb) jQuery plugin for crossfading images as you scroll down a page. Instagram Lite is a simple, lightweight jQuery plugin used to display a user's Instagram photos.